Taken by myself, 7pm. Gate of St. Paul's church in foreground. 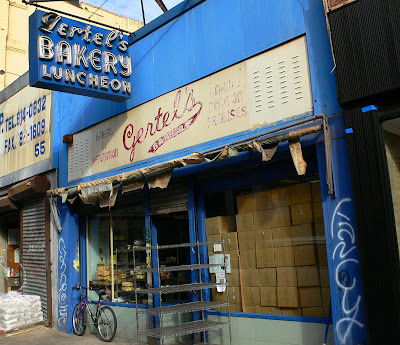 From Jeremiah's Vanishing New York: "New York has been changing since its inception. That's obvious. Blocks and buildings rise and fall. Seventy years ago, half of Houston Street vanished from the city--and the city survived. But today the rate of change has become excessive. Block after block after block, New York is devoured. We don't get one Marc Jacobs store, we get half a dozen. Such is the inevitable march of progress today. The things worth looking at in this city are dwindling. What we take in visually becomes our thoughts. 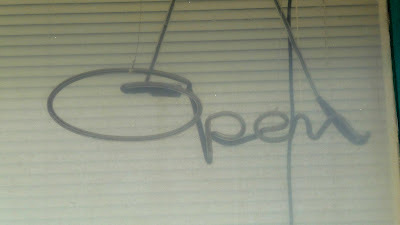 When we look in the window of a pawnshop, we see stories--wedding rings tell of love lost and betrayed, guitars speak of dreams deferred, typewriters tell more tales than we can imagine here. What will our thoughts become when all that's left to see are the blank faces of condstrosities?" Corner of Bowery and Houston, soon to be a designer restaurant. 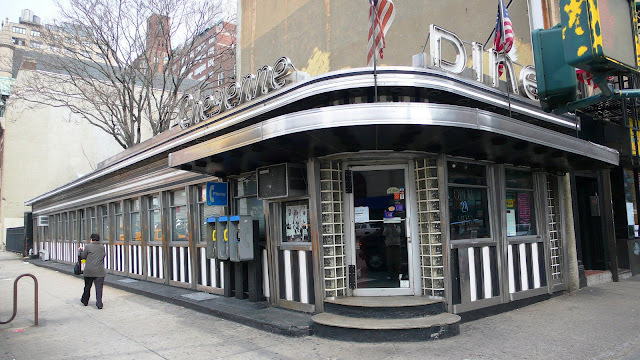 As with my very first post, here are some pics of the Cheyenne Diner in midtown, now closed and awaiting relocation to Red Hook. Lucky Stiffs! FROM CHARLOTTE, N.C., THE QUEEN CITY! NO SPELL CHECK NEEDED HERE! 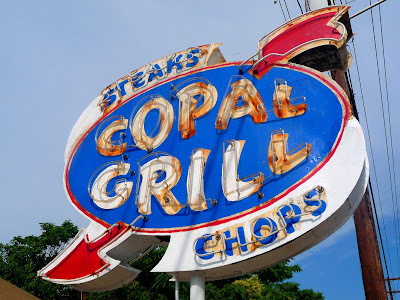 COOL 50S NEON, THE REAL THING! 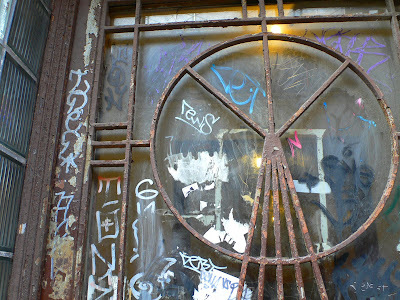 At the Manhattan side of the Brooklyn Bridge you see these old doors and windows in large archways. Phillip Lopate's excellent book Waterfront explains that in the 1800s the bridge was home to many manufacturing businesses. 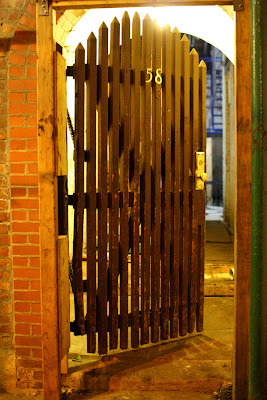 The textile, maritime and service businesses eventually died out; now these doors led to dark passageways inhabited by homeless men. 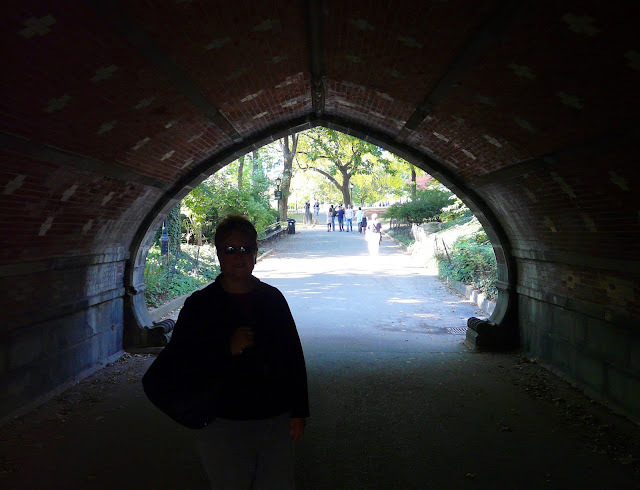 No one even seems aware of the Brooklyn Bridge's past life as employment hub, but it seems to me that these old tunnels and passageways would make great art galleries, coffee shops or the like for the steady stream of folks traipsing the adjacent South Street Seaport. Yesterday I received the "Blogging Friends Forever" Award through Fredrik Ekblad at Ystad Daily Photo. Thanks a lot Fredrik, your great pics inspire me on a regular basis and help me travel the globe! 1. Only five people are allowed. Please visit these blogs to enjoy their excellent photos and personal experiences of their native cities. SO LET IT BE WRITTEN SO LET IT BE DONE! New York Times: "In a vivid example of the culture clashes of the new Bowery, in which the old zone of poverty and bohemianism is quickly being transformed into Manhattan’s latest luxury district, Mr. Varvatos has created a slick simulacrum of the old club to help sell $250 shirts and $2,000 jackets. " 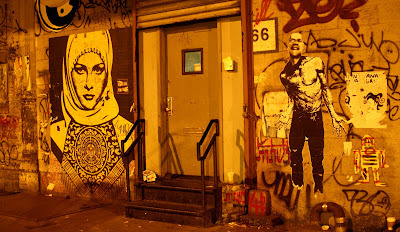 When I first arrived in NY in the late 80s, a walk down Bleecker to CBGB's was dangerous in itself, never mind the club. 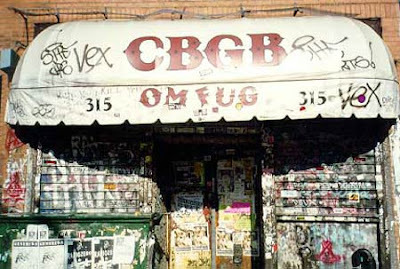 Once inside, your ears were blasted by bands who made CBs their first destination. I can't count all the great bands I saw here. But now, like the rest of the neighborhood, CBs is over and the designer crowd who lives in the nearby mega million dollar condos have control over the entire city. Rant over. The one, the only, Russ & Daughters, in the Lower East Side since 1914. Mars Bar, East Village. No frat-holes allowed. Believe it or not, this bar is surrounded by luxury condos. 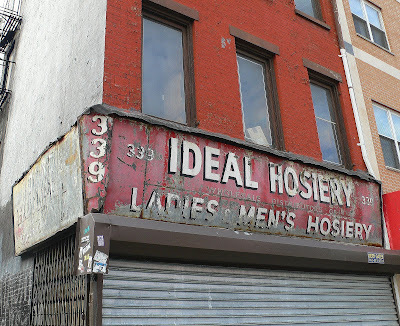 A remnant of CBGCs era East Village. East Village appliances, neon included. 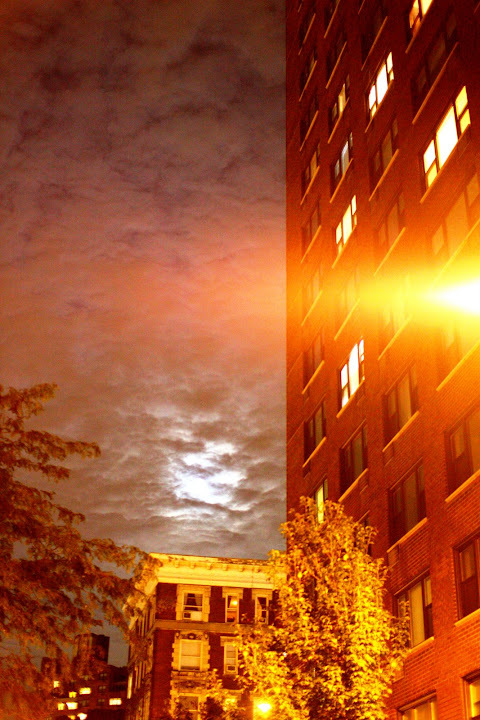 The most celebrated watering hole in the West Village has its ghosts. 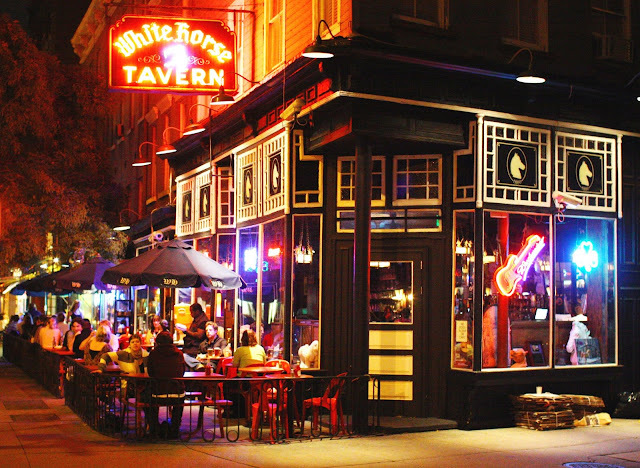 Poet’s Org: The White Horse Tavern, built in 1880, has been a stomping ground for New York’s literary community since the 1950s when the bar’s most famous patron, the Welsh poet Dylan Thomas, was introduced to this longshoreman’s haunt. The White Horse holds the dubious distinction of being the place where Thomas drank his last whiskey. In November of 1953, Thomas beat his own personal record by downing eighteen shots of whiskey. Soon after the last drink he stumbled outside and collapsed on the sidewalk. He was taken to the Chelsea Hotel and there fell into a coma; the next morning he was transferred to St. Vincent’s Hospital where he died. If Thomas is haunting the pub, he's not making himself a nuisance. "He's never a bother," says owner Eddie Brennan. In fact, the ghost may have provided at least one worker with a few free drinks. A porter hired to carry kegs down to the basement often told Brennan he heard footsteps in the bar and found an empty beer glass and shot glass on Thomas' favorite table, near the radiator in the middle room. The bar soon drew more literary figures as patrons including James Baldwin, Norman Mailer, and Anais Nin. The bar was also a gathering place for both the Beat writers, like Allen Ginsberg and Jack Kerouac, as well as the New York School poets, such as John Ashbery and Frank O’Hara. 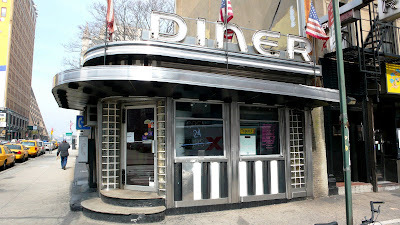 Bob Dylan was a regular here in 1961, often to watch the The Clancy Brothers play. 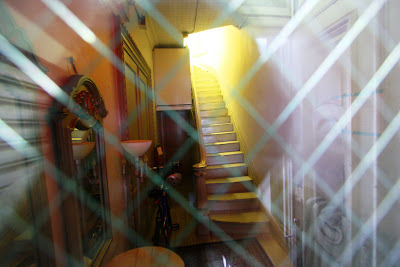 The secret entrance to the currently closed Chumley’s. 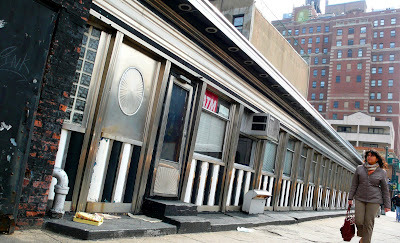 Forgotten New York: Chumley's is probably the only major bar or restaurant in New York City that has never had a sign or marking of any sort on its exterior to mark its presence. Yet most Greenwich Villagers know where it is, officially 86 Bedford Street just north of Barrow, and most nights, it's packed. Chumley's building dates to the 1830s and was originally a blacksmithery. According to legend, in the pre-Civil War era it was a stop where escaped slaves could find a haven (there was a black community on nearby Gay Street). 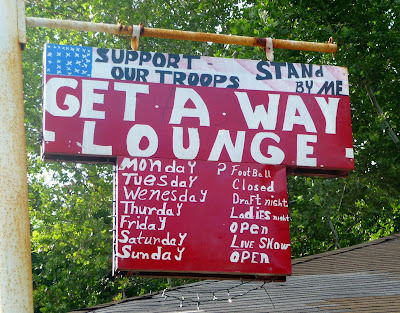 At length it became a gathering place for leftist radicals. 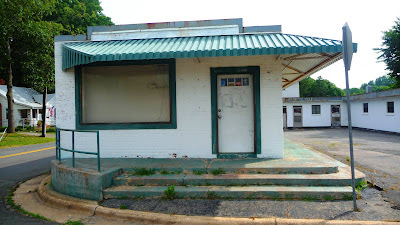 By 1922, Leland Chumley had established a speakeasy/gambling den in the old building; the tradition of not marking the entrance continues to this day. 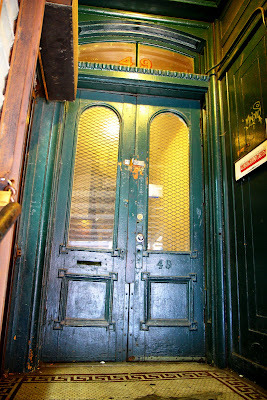 During and after Prohibition Chumley's became one of NYC's many literary hangouts. The difference here is that the authors' original dust jackets, and their portraits, line the walls of the place on all sides. You will find just about every big name in 20th Century literature here from Hemingway to Mailer to Ginsburg on the wall. 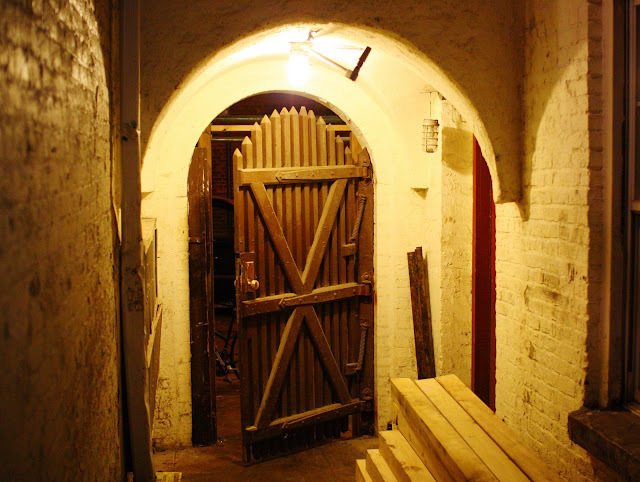 Chumley's is accessed via a small passageway leading from Barrow Street called Pamela Court. According to legend the term "86 it" for "kill it" or "forget about it" comes from a warning the cops would give, phoning ahead to Chumley to let him know they were on the way and customers should "86" or book out the entrance/exit. 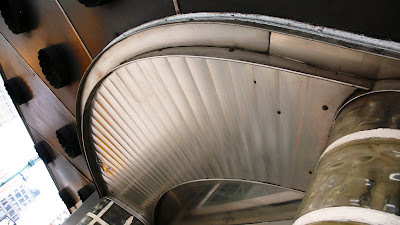 This fabulous hunk of neon and chrome love has been serving up brews since 1937, and it looks as if some of the original patrons haven't left their bar stools since it opened. The red walls are battered and the lumpy, the red-leather booths slope toward the center of the room, where the floor is covered with original checkered tile. Odd knickknacks (Godzilla doll, wooden ships) covered in decades of dust fill the shelves. Okay, this isn’t the kind of place trendy hipsters with two day fuzz and their peachy cream girlfriends on their way back from Brown would deign to spend an evening, but for we lovers of history and reality in NYC, this place is the most. 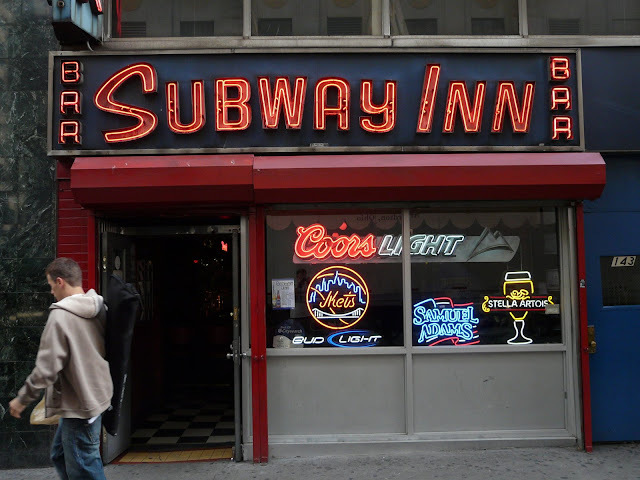 The landlord owns the building, so the Subway Inn (located across from Bloomingdales should you desire a shot post-shopping), ain’t going nowhere. 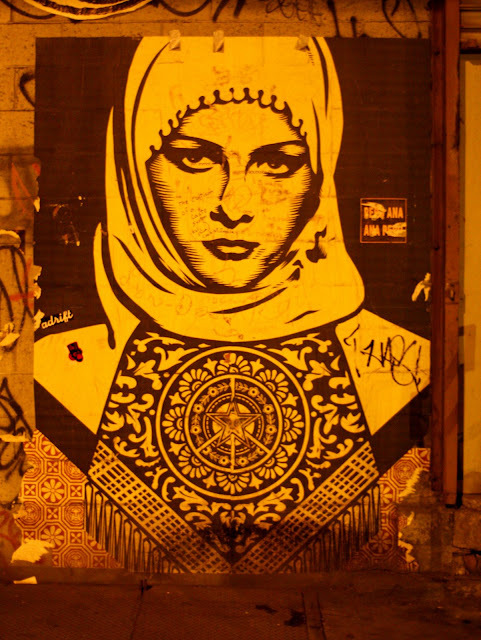 I suppose this loosely comes under the category of graffitti, but it's really quite lovely don't you think? 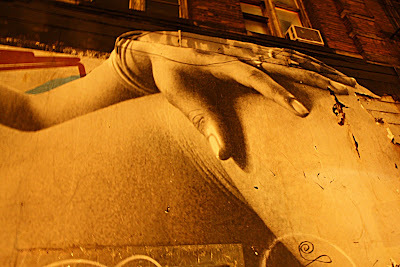 Eliane correctly called it a mural, it sits on a wall in the the West Village's ever gentrifying meatpacking district. 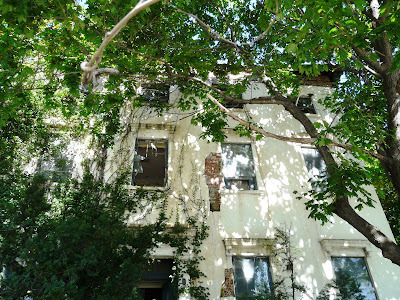 Here's a few pics from my recent trip to Admiral's Row at the Brooklyn Navy Yards. These historic Civil War mansions once housed the officers of the US Naval Fleet. Basically abandoned since the early 70s, the six houses are in an incredible state of ruin and disrepair, though they have been judged to be of landmark status by the Navy Corp of Engineers. 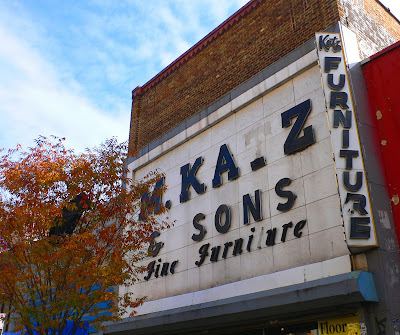 Currently, a battle rages whether to demolish Admiral's Row to make way for a supermarket, or preserve, revitalize and award them with National Historic Register status. 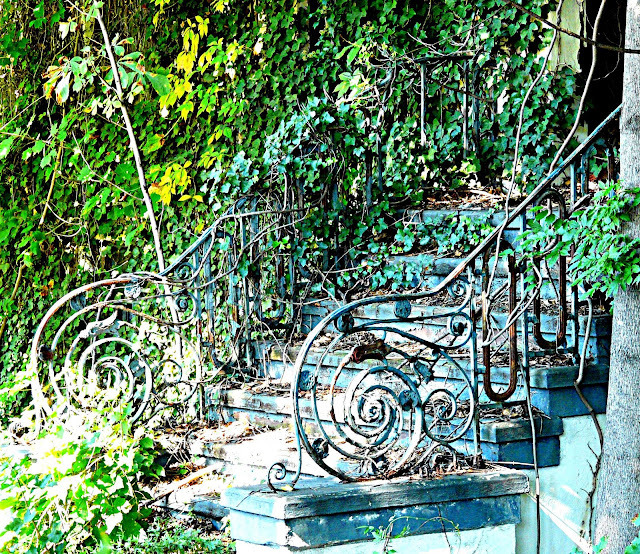 Though it can be hard to actually see them amid all the overgrowth, these are beautiful examples of 1860s era architecture. 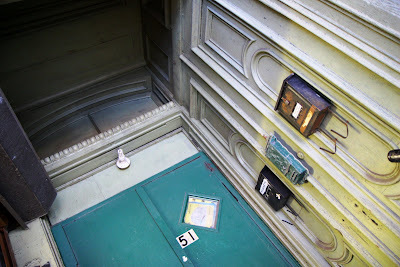 Check my other site, Discovering Admiral's Row, for more pics, which I will be updating as the months grow colder and the buildings become more visible. 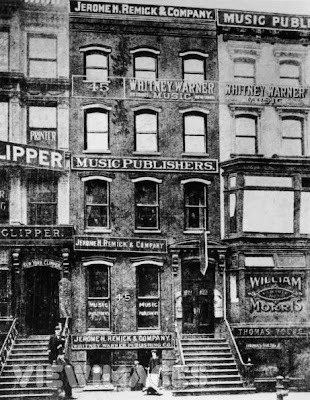 Just as New York's economy crashes, Tin Pan Alley, which helped make the City a haven for good times, hits the fiscal chopping block. 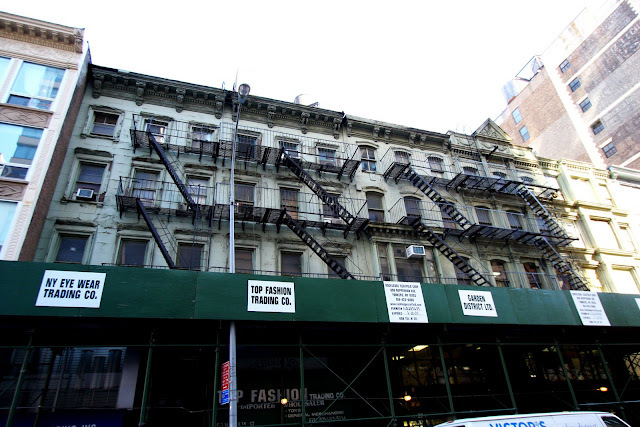 As originally reported by Brooks of Sheffield at Lost City,the historic block of five buildings on West 28th Street that constituted Tin Pan Alley are up for sale. That’s just like New York under Bloomberg, isn’t it? 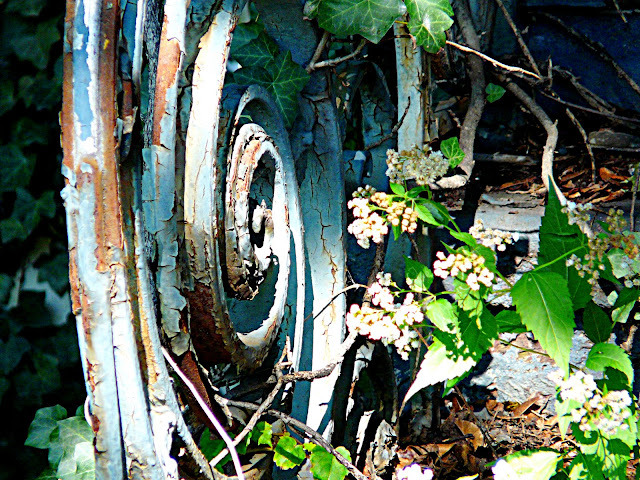 Abandoning the historic parts of the City for more glass and steel condos. But it's gone too far. Surely the ghosts of Irving Berlin, George and Ira Gershwin, Hoagy Carmichael, Scott Joplin, Cole Porter, Fats Waller and the other greats who created America’s original soundtrack are flinching in their skeletons. I spoke with one resident senior citizen sitting on her stoop who said she fully expects the tenants to be either evicted or bought out prior to the block being razed. From Lost City: “The listing has been up since September. One can only hope that, with the current economy, the seller doesn't have a chance in hell of making that price. 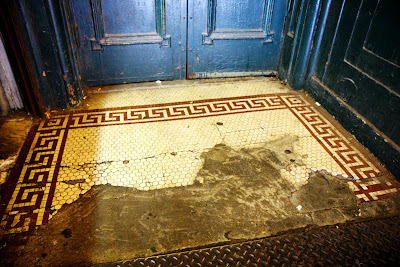 Lost City has previously decried the fact that these buildings—once home to music publishers that fostered the talents of songwriters Gershwin, Berlin, Donaldson, Carmichael, Warren, Waller, Kahn, Cohan, Mercer, Youmans and dozens more—have been left to rot, with nothing marking their significance to American culture save a small plaque. They don't enjoy landmark status. No pocket museum or tourism bureau marks their presence. It's a positive shanda!"